The many paths available to getting on tour. Best and worst parts of the job. 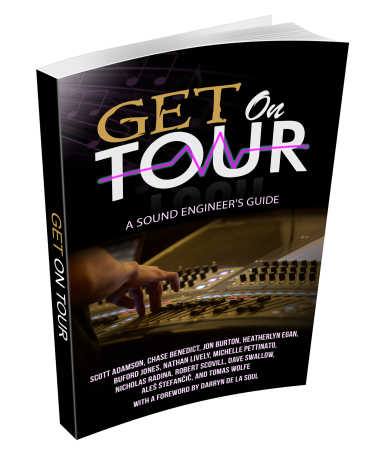 How much touring engineers make. And you can download it for free until Sep23 at midnight! The most common career-related question I get is how to get on tour. There are some questions that deserve nuanced answers from multiple viewpoints, and this is one of them. Instead of trying to answer the question directly (e.g., work hard, get lucky, sacrifice a lamb) the best thing I can do is gather compelling stories. The career paths outlined in these stories will give you ideas for actions and next steps in creating your own path. The only rule is that you must take action or the ideas will be forgotten. I have attempted to order the chapters by experience so that you can first hear from someone who may only be a few years ahead of you and later from people who have been touring for 30 years or more. This is an experimental project and you will notice that the format and style varies between contributors. Don’t worry about the form: the content is paramount. All of the contributors to this book are sharing their stories in an effort to help you, the reader. Visit their websites, connect with them online, and reach out to them with any follow up questions you might have or experiences you’d like to share. I respect your privacy. I will never share your email address with anyone, period.